I was recently invited to do an early morning interview on 98 Rock radio in Baltimore, MD. I had to be on the air at 5 am (PST) in order to make the "drive time" slot on the east coast, but it was well worth it. The hosts were fun and encouraging, and they asked good questions that helped me do a little educating of the general public. Thank you, 98 Rock! You can also go directly to the station's page by clicking this link. Great interview. I hope you get picked up for a second season too. Hey Cliff - I enjoyed your blog and the show. I grew up as a kid enjoying summers in Skamania County at a lake club. I've always been a believer as there's been more than one occasion fishing alone as a kid from a boat seeing/hearing things and honestly feeling like "something was watching me." I happened to also be from Eugene where John Fabian Director of Boggy Creek lived in my neighborhood. I now reside in Seattle (King Co) area and am now too interested to see all the sightings up here. I hope to someday participate in a hunt...and maybe even see/hear this creature during a local fishing expedition. Continued best of luck in your pursuit. 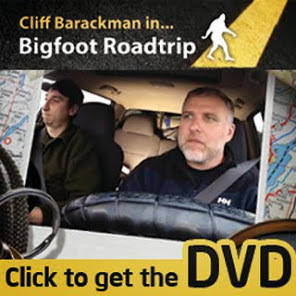 Finding Bigfoot - Possible Sighting? Finding Bigfoot - "Swamp Ape"